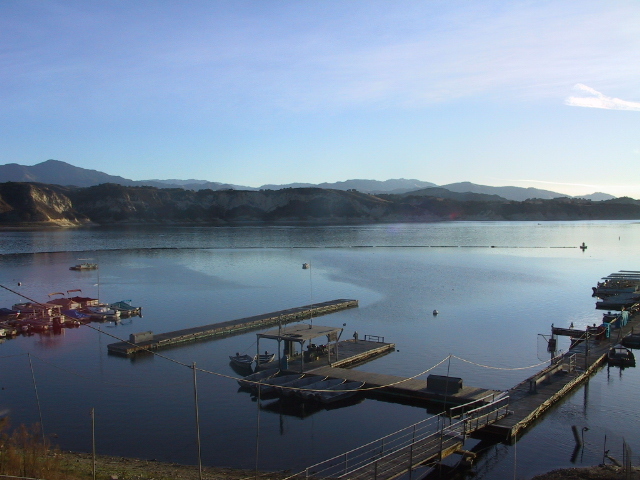 Lake Cachuma is located near the city of Santa Barbara. From Hwy. 101 take Hwy. 154 North 25 miles to the lake. The lake consists of 3,100 surface acres at capacity. It is open year round from 7 am to 5 pm. in the winter and 6 am. to 8:30 pm. in the summer. Entrance fee is $10.00 per car. Tent, trailer and RV camping is available for $25 and up per night. Call for reservations! (805) 686-5054, (805) 688-4040. There is a well stocked general store to serve your needs - (805) 688-5246. Visit Cachuma Lake Website for more information. This lake holds a variety of gamefish including Large and Smallmouth Bass, Channel and Blue Catfish, Trout, Crappie, Red-Eared Sunfish, and Bluegill. All are abundant here and 2-digit Bass and Catfish are not uncommon. There is no swimming/skiing allowed which makes this a nice lake to fish. Tackle Shop (805) 688-4040 Fishing Report (805) 688-7724 Be sure to visit the CDFW web site for complete regulations before heading out. For trout, try Cachuma Bay or over by the island in the wintertime and troll leadcore by the dam or in the channel during the summer.